Billionaire Carl Icahn, who has been buying large amounts of Apple stock over the past three years, today told CBNC that he sold his stake in the company. "We no longer have a position in Apple," Icahn told CNBC's "Power Lunch" on Thursday, noting Apple is a "great company" and CEO Tim Cook is "doing a great job." Icahn, who sold his shares earlier this year, said that he did so based on worries over China's attitude towards Apple. Earlier this month, the Chinese State Administration of Press, Publication, Radio, Film and Television forced Apple to take down the iTunes Movies and iBooks stores, and Chinese officials believe that Apple is "too deeply established" in core industries in the country. Apple sales also fell 26 percent in greater China in the second quarter of 2016. "You worry a little bit -- and maybe more than a little -- about China's attitude," Icahn said, later adding that China's government could "come in and make it very difficult for Apple to sell there... you can do pretty much what you want there." Prior to exiting his position, Icahn held 0.8 percent of outstanding shares. He told CNBC that he made approximately $2 billion on Apple and that he continues to view the stock as "cheap." Apple shares have been on the decline since Tuesday's earnings call, where the company announced its first ever drop in iPhone sales and its first year-over-year revenue drop in 13 years. Apple stock is down approximately 2 percent today. Finally, we'll no longer have to see his creepy smile. 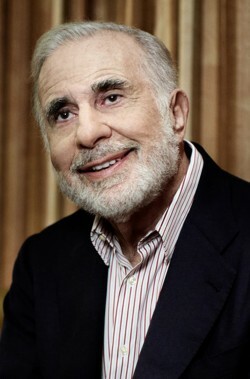 "Carl Icahn Pumps and Dumps AAPL And Makes $2 billion." The Wall Street garbage I've read today is making me feel like the entire world has gone insane. I remember having a iPad 3 and it's probably my pinnacle Apple Product. It never Crashed, it was lighting fast (not as slow as its now), it looked good (still does I think) and I used it and loved it! My iPhone works mostly but the batter is no where special on it, the camera could have been better and should have been more waterproofed (like they are more water proof than iPhone 6 but I mean Apple Watch quality). The Samsung Galaxy S6 edges out the iPhone I hate to say and I could have well ended up with a Samsung Galaxy S6. I can't say his stance is wrong. China is being unusually aggressive about trying to stop Western influence. The USSR tried that as well, and it ended up costing them dearly in the end. People will naturally flock to the "forbidden fruit" out there. Anyone notice Icahn is an anagram of China? Illuminati confirmed. I expected no less than a pump and dump scheme from him. The world clearly went insane a long time ago. China is a very erratic country in regards to how they treat American companies selling goods there. I think American companies would be smart to pull manufacturing out of there and set up elsewhere. Obviously this will take time, but we as consumers can start but not buying clothing made in China. Why should we give them money if they treat our companies so badly? This should also be a wake up call to Tim and co. - they need to step up their game. Services can't be updated once a year - they need to be continually updated. Tic toc of iPhone upgrades won't work anymore. If iPhone 7 looks like 6 again that means they will have lost another year. Tim - light a fire under your employees asses. Another quarter where AAPL made billions in revenue and turned out billions in net profit...time to dump the stock, watch the price plunge, and go running for the hills! I have never been able to understand AAPL's valuation and strange price movement (relative to comparable stocks).